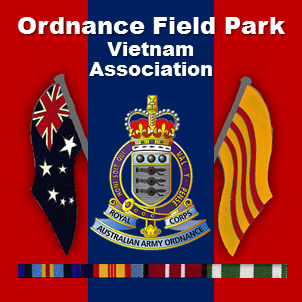 About Us – Ordnance Field Park Vietnam Assn. This is an overview of the Ordnance Field Park in Vietnam from its arrival in May 1966 until the withdrawal of the Australian Force in February 1972. Read about what the life of an Ordnance Field Park soldier was like in Vietnam. The first Ordnance Field Parks were established during the Second World War. They served with distinction in the Middle East, in Syria and at the siege of Torun, and later on in the New Guinea campaign. From 1955 to 1966, RAAOC was represented by a small group of personnel posted to the 28thCommonwealth Infantry Brigade Ordnance Field Park (28 OFP) during the Malayan Emergency. Phase one of the Vietnam conflict saw the deployment of RAAOC personnel in the war as part of 1st Australian Logistic Support Company (1 ALSC) with 1st Battalion Royal Australian Regiment (1 RAR) in Bien Hoa in May 1965. In 1966 the Australian commitment was expanded to an independent task force which included two infantry battalions (5 RAR & 6 RAR), an artillery regiment, a cavalry squadron and other supporting arms and services. The detachment was required for service in Vietnam in support of the 1st Australian Task Force (1 ATF) based at Nui Dat, and was to become integrated into the Task Force Administrative Area (TFAA), and later on, in late 1967, into the redesignated Task Force Maintenance Area (TFMA) in Vietnam. The task of units within the TFAA / TFMA was “to provide immediate logistic support to the 1st Australian Task Force”. The following were the units that made up the TFAA / TFMA; HQ 26 Company Royal Australian Army Service Corps (RAASC), 85 Transport Platoon RAASC, Detachment 52 Supply Platoon RAASC, Detachment 25 Supply Platoon RAASC, Detachment 8 Petroleum Platoon RAASC, Detachment 176 Air Dispatch Company RAASC, Detachment 1 Divisional Stores & Transport Workshop, Ordnance Field Park RAAOC, Detachment 1 Communication Zone Postal Unit, Detachment 11 Movement Control Group Royal Australian Engineers (RAE), Detachment Australian Forces Vietnam Cash Office and Detachment 2 Australian Force Canteen Unit.
. The maintenance of a reserve of controlled stores on behalf of the Task Force Commander.
. The receipt in bulk and distribution in unit lots, of stores and equipment which had been requested by 1 ATF units, and procured from a variety of sources.
. The provision of troops for the defence of the Task Force area. These defensive responsibilities include the participation in the patrolling program, in and around the Task Force Base, including the TAOR Patrolling program and the ATF Ready Reaction Force. The detachment’s scaling of stores were deliberately reduced to cater for the maintenance of Landrovers, the fleet of International trucks, the 7.62mm range of weapons and the Owen Gun as well as its normal scaling of stores. The original maintenance plan (later criticized by the Director of Ordnance Services) envisaged that all of the logistic support for the Australian forces would be provided by the US Army logistic system in Vietnam. This had been the case with the Australian battalion group operation out of Bien Hoa in 1965, The original Ordnance Field Park detachment consisted of fourteen personnel (one Officer and thirteen Other Ranks) to service the needs of two infantry battalions (5 RAR and 6 RAR) plus the supporting arms and service elements. The absurdity of the situation could be best demonstrated by considering that the staffing level of the 101st Field Workshop Stores Section, also committed to service in Vietnam was one Officer and sixteen Other Ranks. The strength of the full Ordnance Field Park at home, carrying out similar work to that of the detachment, was three Officers and forty seven Other Ranks. The fourteen personnel selected for active service with the detachment were the cream of Ordnance soldiers at that time. The advance party of the detachment, along with the Task Force’s scaling of stores sailed aboard HMAS “Sydney”. Ten days later, on 4 May 1966, the main body of the detachment departed RAAF Base Richmond on a B707 Qantas charter flight to Vung Tau (via Townsville, Manila and Saigon). On arrival in Vietnam the detachment’s main body linked up with the advance party on the “Back Beach” at Vung Tau. 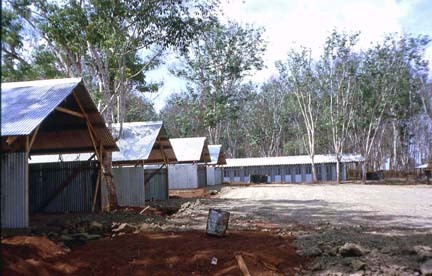 The detachment was accommodated in the 1st Australian Logistic Support Group (1ALSG) area where they spent about a month refurbishing and reconditioning stores whilst the 1st Australian Task Force (1 ATF) position at Nui Dat was being secured. On 5th June 1966 the 1st Ordnance Field Park (Detachment) consisting of fourteen personnel under the command of Lieutenant Norm Clarke deployed forward to the Task Force Administrative Area at Nui Dat. Upon arrival at Nui Dat the detachment was allocated an area which was part of the 1st Australian Reinforcement Unit’s (1 ARU) perimeter and worked quickly to establish its position on a Hill called “Nui Dat 2″. The hill was located next to “Nui Dat 1” which was so named because it was the highest and most prominent feature at the Task Force Base. Nui Dat 1 was occupied by a Special Air Service (SAS) Squadron and was commonly referred to as SAS Hill. It was a time for uncertainty and intense sustained activity as 1 ATF developed its base and began operations throughout the province to dominate its area of operation and deny freedom of movement to the North Vietnamese Army (NVA) and Viet Cong (VC) as part of phase two of the Vietnam conflict. The allocated OFP position on Nui Dat 2 Hill was amidst fairly dense vegetation comprising mainly low scrub and a few tall trees with rubber plantations in the surrounding area occupied by other 1 ATF units. A rudimentary road system was developed by Royal Australian Engineers (RAE) amongst these plantations to serve the considerable vehicle activity within the base. These routes were unsealed but some were covered with loose blue metal surfacing to provide hard standing and relief from the heavy red dust that rose from the red clay in summer months and the sticky red mud that accumulated during the wet season. The main supply route to Nui Dat was from Baria which, although described as a ‘Class A All Weather’ road on military maps was in extremely poor condition for most of the time and deteriorated markedly during the wet months. Local road conditions were aggravated by the ‘right hand drive’ rule which applied to the Vietnamese road system. It was not unusual to see traffic congestion on this busy main supply route where military vehicles would be occupying the left and right lanes, whilst a multitude of Lambrettas, motor cycles, bicycles, and oxen-drawn carts driven by the locals were using the centre lane, or wherever else they could fit, by weaving in and out of the military traffic. Enemy actions of demolishing major bridges along Route 2 in earlier attacks (1965/66) seriously impaired the traffic flow and all traffic had to negotiate a makeshift narrow replacement spans over rivers. Throughout the deployment of 1 ATF, helicopter resupply enabled urgent logistic supply activity to be maintained when road convoys were interrupted due to congestion or enemy action. A laundry service was established at Baria, the provincial capital, by the Detachment in late 1967 after camp beds and linen were supplied. This service handled the laundering of two sets of jungle greens per soldier per week and bed linen. Laundry was done under local arrangements by towns’ people. A problem arose when the laundry contractor in Baria started to use fish oil based soap on the Australian laundry which had the effect of attracting many thousands of flies with black back (flies) a common complaint. As a result the Deputy Assistant Director of Ordnance Services, Australian Forces Vietnam (DADOS AFV) had to arrange the supply of soap powder from Australia and strictly supervise its use; otherwise the contractor would sell the soap on the local black market. It soon became obvious, even to the Task Force Headquarters that the site allocated for the 1st Ordnance Field Park (Detachment) was unsuitable to accommodate its wide range of activities. Furthermore logistic activities were being observed by the Viet Cong. This added dimension was graphically illustrated when the first Viet Cong mortar attack on the Task Force Base occurred on the night of 17th August 1966. The mortar strikes landed in the detachment’s position while other rounds landed in adjacent areas occupied by the 1st Australian Reinforcement Unit and the Postal Unit. Luckily no OFP personnel were injured although the detachment’s bulk stocks did not fare so well and considerable damage was suffered. Detailed stock escaped unscathed from mortar shrapnel due to the ‘bin pack” storage system being used by the detachment. Due to the tears in the canvas caused by shrapnel, the storage tents provided limited storage from the rains until such accommodation was gradually replaced. This mortar attack occurred in Nui Dat in the early morning on the day before the battle now known as “The Battle of Long Tan”. Apart from the shelling of the ordnance element of the 1st Australian Logistic Support Company at Bien Hoa in 1965, this was the first time since the Second World War that an independent RAAOC unit had been subjected to direct enemy fire. As a result of the mortar attack, negotiations for a new area for 1stOrdnanceFieldPark (Detachment) were given added impetus when the Australian Government, as part of the build up of the 1st Australian Task Force, announced an increase in the Task Force to a three battalion force. The announcement in turn came with the decision to return the 1st OrdnanceFieldPark (Detachment) to Australia after its twelve month tour in Vietnam. The 1stOrdnanceFieldPark (Detachment) was to be replaced by a detachment from 6thOrdnanceFieldPark stationed at Gaythorne in Brisbane. A new location for the 1stOrdnance Field Park (Detachment) and the replacing 6thOrdnance Field Park (Detachment) was of primary concern and a new area was quickly located at the eastern end of Luscombe Airfield, in an area adjacent to the 6th Battalion Royal Australian Regiment. Development of the new area proceeded quickly enough to allow the 6thOrdnance Field Park (Detachment) to occupy the new facilities on their arrival in Nui Dat from Australia in late April 1967. The new facility initially comprised a number of simple concrete-floored. galvanised iron, open ended shelters for storage with hard standing (a luxury in those days) to enable off loading of vehicles from daily stores convoy from 1 ALSG in Vung Tau. 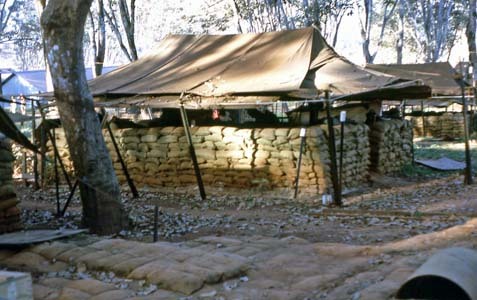 The headquarters building was a prefabricated Lysaght hut; however living quarters were to remain in the ubiquitous 16×16 foot sandbagged tents, with messing facilities being provided by 6th Battalion Royal Australian Regiment. The detachment’s new location and accommodation was a substantial change and a far cry from its old position on the “hill”. The 1stOrdnance Field Park (Detachment) ceased its operations in Vietnam on 5th May 1967 and returned to Australia on 7th May 1967. Upon the arrival of the 1stOrdnance Field Park (Detachment) in Australia on 8th May 1967 its personnel were either posted to other ordnance units in Australia or absorbed in to the Ordnance Field Park at Holsworthy, New South Wales. The 6th Ordnance Field Park (Detachment) continued to support the lst Australian Task Force in Vietnam from its new base at the eastern end of Luscombe airfield adjacent to 6 RAR. By mid 1967 the decision was made that most support units would replace personnel on a man for man basis, rather than a unit by unit basis, as had been the case in the past. This resulted in the commencement of the rotation of some members of the 6thOrdnance Field Park (Detachment) in late August 1967. There is some argument that the unit replacement system was preferable to the replacement on an individual basis. Better team work and a sense of belonging amongst the troops were more evident in the units that were replaced on a unit basis (eg. Infantry Battalions). Troops who arrived under the man for man replacement basis (short timers) struggled for some time until they were accepted by those who had been with the unit for a longer period. In many cases, Vietnam Veterans, to this day, are still struggling with psychological problems associated with this type of posting. 2Lt Alan Davis (Unit 2IC in 1969) recalls that because the OFP was reinforced on an individual basis rather than as a unit, it suffered from the wide divergence of knowledge, from the new ‘Reo’s,’ to those who were on their run down. Looking back, he now realises that this caused a lot of difficulties, not the least being that a level of theatre knowledge was assumed without giving the new boys any structured training. As part of the build up of the 1st Australian Task Force to a three battalion force, it was announced that the Detachment of the 6thOrdnance Field Park would be raised to the status of a full strength Ordnance Field Park. As part of this reorganisation the detachment of 6thOrdnance Field Park was redesignated as the 1st Ordnance Field Park on 1 February 1968, the name the unit kept for the remainder of the Vietnam Conflict. The 1stOrdnance Field Park operational strength in Vietnam was two Officers and forty two Other Ranks. The unit’s organisation consisted of a Headquarters element, a Provision / Control Section, Internal Audit Section, Headquarters Section, Bath Section and a Stores Platoon. A Supply / Control Group and Documentation Group were also included. The 1stOrdnance Field Park continued to support the 1st Australian Task Force and offered a full range of Field Park services, including service demands, US supply and self service. All bulk supplies of ordnance stores and equipments were shipped from Australia to 1 Composite Ordnance Company, Vung Tau (the unit title was later changed to 2 Composite Ordnance Depot in May 1966). Resupply problems were experienced in Vietnam in later years (1968-1970) when ordnance stores and other defence supplies were delayed on the wharves in Sydney as a direct result of dock strikes. This affected not only operational activities, but also interfered with the troops’ comfort and recreation in that commodities, such as beer, were not arriving in theatre. Fortunately the majority of rations consumed in Vietnam were sourced from the US supply system. Additionally, ample stocks of American beer could be obtained, albeit the Yankee brew was not like the real thing. In a bid to reduce the amount (the sheer bulk) of stores required to be shipped from Australia on the “Jeparit”, the local purchase staff at DADOS AFV in Saigon set to work procuring commercially available items. Items procured by DADOS AFV staff included furniture, industrial gases, construction materials, stationery, steel piping and kitchen utensils with more than A$1 million being expended annually on these commodities. 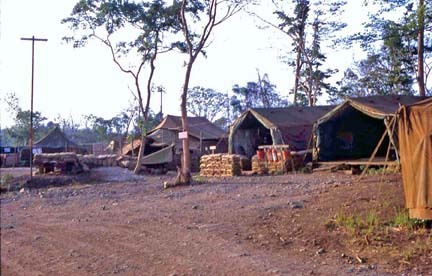 By now the ordnance resupply system to 1 ATF was based on the Ordnance Field Park at Nui Dat providing direct or second line support, with 2 Composite Ordnance Depot, Vung Tau, providing general or third line support. There were three categories of demands – viz – Routine, Service or Staff demands. A Routine demand was submitted in the form of an indent on the OFP. If the stores could not be provided from either the OFP at Nui Dat or 2 Composite Ordnance Depot, or from within US stocks held at Vung Tau, a signal demand would be referred back to AHQ Melbourne in order to satisfy the requirement. The stores from Australia could then be delivered by RAAF air or by sea into Vung Tau according to operational priority. Equipment requested on a routine demand was delivered from 1 ALSG to the OFP for redistribution, or if required direct to units by second line RAASC transport. 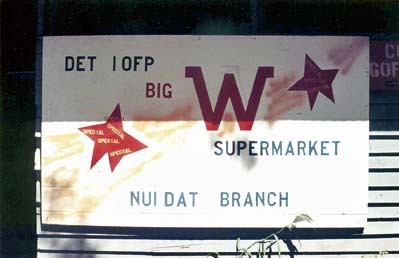 Service demands covered the whole range of stores and supplies and were solely for use by 1 ATF units in the Nui Dat region. They included those stores commonly used (i.e. rations, Petrol Oil & Lubricants and ammunition). These service demands were sub-categorised into maintenance demands, priority maintenance demands and operational demands. The crucial point about the types of demands was the timing allowed for their processing – a maintenance demand delivery may be required within 48 hours of submission of that demand on the ordnance unit or depot. Priority maintenance demands were requisitions for stores which had to be delivered to the unit within 24 hours of the identified need and operational demands were urgent requests requiring immediate action and delivery. Obviously the operational demand took priority over all other transactions and delivery was affected by either scheduled road convoys, aircraft or if dictated by the staff by alternate special delivery means using either vehicle, helicopter or watercraft to deliver the operational needs to the first line units. Staff demands on the other hand were raised by 1 ATF for vital stores such as controlled stores, vehicles, weapons or urgently required operationally significant items which were to replace equipment lost in battle, or were not on unit establishments or equipment tables, but were needed by the Australian Task Force actively involved in field operations. 1 ALSG conducted a daily logistic conference at Vung Tau to plan the resupply program for the next day in order to provide required supplies for 1 ATF. Representatives from the support group elements attended these conferences which considered the details of current demands and determined unit and load priorities. Transport was also scheduled and the back loading of stores and salvage was also arranged. An intelligence officer was normally present at the conference to brief the representatives in attendance on current enemy activity, road closures, road conditions and any road detours. Depending on the amount of such enemy activity, resupply would either be conducted swiftly, without interruption, or could be delayed for several hours awaiting a change of circumstance in the area. 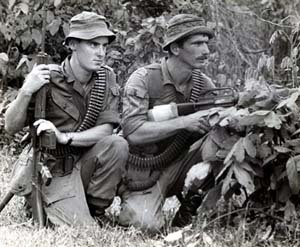 Phase 5 of Australia’s involvement in the Vietnam War, during mid 1969 to August 1971, saw counter-guerrilla and pacification operations being conducted concurrently with the aim of upgrading ARVN regional forces. Operations continued against the ever present enemy and villages were secured by land defoliation and erection of man proof perimeter fences. Simultaneously, the Australian Task Force carried out an extensive civic action program designed to improve health, education, living standards, the country’s economy and the morale of the local villagers. Australian Civil Aid Teams, comprising volunteer medical staff, operated extensively in South Vietnam freely giving their services to improve the life of the less fortunate villagers. It was hoped these measures would result in an increased resistance by the Vietnamese community to the Viet Cong infrastructure, while at the same time providing a more positive and demonstrable means of gaining acceptance of the presence of the allied forces. In 1970 the US Government determined that the Vietnamese were quite capable of handling their own political affairs and should take over complete responsibility for the future conduct of their internal conflicts. In April 1970, the Australian Government made the decision to withdraw one battalion of its troops after completion of its current tour of duty and not replace it. Similarly, it was decided in November 1970 that the Australian troops would follow the American decision to scale down involvement in Vietnam and commence withdrawal procedures for Australian units as current tours of duty came to an end. By 1971 distinct progress had been made in Vietnamese communities with allies having improved roads, irrigation systems, instituted education programs and established medical and dental facilities. By late March 1971 the withdrawal of the 1st Australian Task Force from Vietnam was well into the planning stage. In January 1971 the Ordnance Field Park was operating with its full complement of staff and equipment. Over succeeding months the unit’s role at Nui Dat reduced again to a Detachment as a number of personnel moved to Vung Tau and became “caretakers” of the stores and equipment that were being relocated as part of the withdrawal phase. The Detachment at Nui Dat had responsibility for controlled stores, the operation of the self service store and the monthly bulk break of clothing and equipment. Subsequently it had responsibility for the wash point operation which was required to clean tanks and equipment being returned to Vung Tau and then on to Australia. When the Task Force moved out of Nui Dat in October 1971, the Detachment ceased operations and moved to join the remainder of the unit at Vung Tau. At Vung Tau the Detachment continued to provide Ordnance support to the remaining Australian land forces in Vietnam, thus enabling 2 AOD to close down operations and withdraw its assets to Australia. 1 OFP Vung Tau conducted a progressive outscaling operation during the latter part of 1971 whilst still maintaining support in theatre. In the final days of the Vietnam Conflict the personnel of the 1st Ordnance Field Park worked long and hard hours, but produced credible results in providing the required ordnance support to the very end. This support contributed to the successful and orderly withdrawal of the 1st Australian Task Force and its supporting elements from Vietnam by February 1972. Some members of the first RAAOC elements were sent to Vietnam without having undergone any prior training or acclimatisation training in Australia. This matter was later rectified by compulsory attendance of soldiers destined to Vietnam at field training (Battle Efficiency) courses which were conducted at the Jungle Training Centre (now known as the Land Warfare Centre) at Canungra. Without this experience provided at Canungra and without any prior knowledge of the war or country in which they were to serve, the first of the RAAOC personnel entered Vietnam with considerable trepidation. Arrival in Vietnam in 1965/66/67 was either by sea on the troopship HMAS ‘Sydney” or by air on RAAF Hercules C130 aircraft. From 1967 troops were usually flown to Vietnam and returned on QANTAS Boeing 707 charter flights. An aspect of life in Vietnam was the need to administer anti-malarial tablets daily, since the jungle environment of Vietnam, with its stagnant pools and intense humidity, encouraged the disease carrying malarial mosquitoes to flourish. Morning roll-call parades were used to ensure that all soldiers were issued with their daily ration of Paludrin medication. Observation by NCOs ensured that the tablets were consumed ‘on parade’. After a belly full of beer the night before, these gagging pills were bitter to swallow and mighty hard to keep down. All OFP soldiers were required to secure their unit’s location by digging trenches, filling sandbags, building Defence Posts (DP) and establishing stores systems in newly constructed storehouses to replace the initial stores tents. Weapon pits were also dug next to their tented accommodation, where they would ‘stand to’ when required in the event of a possible attack. Beside their normal duties within the Ordnance Field Park, other tasks were assigned to OFP soldiers such as assisting in the joint protection of the Task Force Base by manning nightly pickets on the Task Force Base perimeter wire. As part of the Task Force Maintenance Area (TFMA), soldiers from the OFP were required to undertake a range of infantry type patrols to allow the infantry to concentrate on external operations against the enemy. The tasks varied from overnight ambushes, standing patrols, fighting patrols, provision of protection parties for overnight civil aid projects, defence of Fire Support Bases (FSB), to much longer activities of up to fourteen days. 2Lt Alan Davis recalls that these patrols took on increased importance since the arms units spent most of the time deployed outside the province. These patrols were run by the Corporals. Any Officers, Warrant Officers or Senior NCOs who wanted to go were relegated to riflemen. On one occasion their patrol (with rifleman 2Lt Davis and radio operator S/Sgt Sid Brent) harboured up in a bamboo thicket overlooking a river. No sooner had they set themselves up and completed their last light clearing patrol, than an enemy group of about twenty came along the river bank below their position. This was probably a supply column rather than a fighting patrol because there were women spaced through the group carrying long poles with lights at the top to show the way. Before they could react this column disappeared from sight around the next river bend, but they could still hear their progress as they skirted to the other side of the bamboo thicket where they also harboured up for the night, some hundred metres from their position. Alan and Sgt Sid Brent assumed control at this point. Alan reasoned that they had the advantage since the enemy did not know they were there, but there was little point starting a fire fight until they could see them. So they radioed Task Force Operations and requested artillery. TF Ops refused on the basis that being ‘Pogos’ the patrol wouldn’t have a clue where they were and TF Ops didn’t want to drop a salvo on them. Before Alan could argue their radio died so they settled down to anticipate dawn and the probability of a fight. In the event, the enemy roused before first light and moved off away from the patrol’s position into the bush. The patrol was unable to react since its way was barred by the bamboo thicket. With dawn they were able to confirm their position with the map so the artillery would have been justified. Alan recalls that the whole situation was quite humorous really. 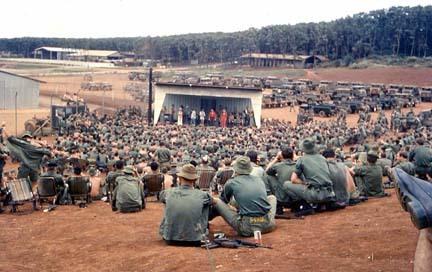 The Task Force at Nui Dat was able to provide some light relief for its operational troops, by establishing an outdoor concert venue at Luscombe Bowl (better known as the Dust Bowl due to the red clay dust that covered the area in summer). Here up to 1,000 troops could be entertained depending upon the operations underway at the time. For the new and uninitiated to Nui Dat, it was a common practice for the old hands with whom the newcomer would be sharing accommodation and duties to advise the new boy of the two social events not to be missed in the local area. They were known as the Baria or Hoa Long dances and the Dat Do dog races. These quite fictitious occasions were supposedly held each Saturday afternoon and army transport was even provided for those who wished to attend. It always caused quite a good deal of merriment back at the lines when a young, keen soldier on the lookout for adventure in a strange country would return to his tent, dressed in his finery, after having waited for a lengthy time for transport which never arrived to transport green Casanovas to venues which didn’t exist. Both Nui Dat and Vung Tau were serviced by Australian Salvation Army and Red Cross staff who were relentless in providing recreational comfort to all troops. They would visit fire support bases and hand out the cool drinks, sweets, books and writing materials and visit the hospitals to try and cheer up the patients. Army chaplains worked side by side with the Salvos, although chaplains generally concentrated their efforts in the bases, providing Sunday morning church services or accompanying the field troops in case they were needed to administer church services and last rite functions in the field. Another comfort to the soldier in Vietnam was the arrival of letters and parcels from home, sometimes from complete strangers who as a result of patriotic radio announcers’ pleas suddenly wanted to contribute to lessening the distance for the troops between Vietnam and Australia. It was not unusual for soldiers to share their parcels from home with their mates (especially cakes, sweets and books) and this provided some link to home which otherwise may have been very distant. A link with home of a different nature was the news of moratoriums being held in Australian cities to demonstrate against Australia’s involvement in Vietnam’s affairs. These moratoria (officially only two were held) did not really register with the Australian troops in Vietnam as their world seemed so far removed from the scenes back home. The concerns of the troops lay more with protecting themselves and their mates and in fulfilling the role assigned to them in Vietnam – the containment of the spread of communism and terror in that region. During a 12 months tour of duty in Vietnam, troops were given five days Rest and Convalescent (R and C) leave in country, and five days Rest and Recreational (R and R) leave which could be taken in either Manila, Taipei, Hong Kong Singapore or Bangkok. In October 1967, Australia was included on the list of countries for taking R and R. This option was received favourably, especially amongst the married or engaged troops who chose to be re-united with their loved ones and dependants in favour of the other oriental destinations. To make life in Vung Tau a little less foreign, a former French villa was commissioned by the Australian and New Zealand armies to operate as a recreation centre. At the R and C Centre the soldiers were provided with fresh food cooked by Australian Army caterers, a pleasant alternative to the powdered eggs, powdered milk, dehydrated vegetables and monotonous menu provided under the scales of issue which the US Army operated in the early years of Australian involvement. The only drawback with Australian troops being rationed under the US system was that repetitive meals occurred for about a month before the menu was changed – the only consolation with being supplied under the US ration system was that there was always an abundance of this food and fresh fruit was rarely in short supply. Christmas Day in Vietnam was particularly memorable. During a tour of duty (unless shortened) it was impossible to miss out on at least one Christmas in Vietnam. Christmas Day meant extra rationing as is the custom for Christmas lunch for the ‘living-in’ soldiers of today. Special ration supplements were sent from Australia, particularly pork, turkey beef and whole vegetables for roasting for Christmas lunch. The officers of most units participated in the old tradition of carving and serving the soldier’s lunch and refreshment. Money was even put in the Christmas pudding and of course Australian coins were used for this tradition since the local currency issued to servicemen was known as Military Payment Certificates (MPC) and was in a paper form only. On the topic of money, all soldiers were paid in MPC currency, which although it was intended for use within military bases only, soon became accepted as legal tender in the towns. Since soldiers had little to spend their money on, except alcohol, cigarettes (which were extremely cheap) or souvenirs to send home; most saved a tidy sum of money during their stay. The Post Exchange (PX) was run in the same style as retail department stores, carrying all lines of goods such as electrical gear, gifts, cameras, cigarettes and anything that a soldier would want to purchase at duty free prices. Through the PX, and aided by an excellent Army operated postal service, soldiers were able to send goods back to Australia. Alternatively, they could stock them up and bring them home through Customs. Favourites amongst the smaller things to be sent home through the mail system were Vietnamese dolls, cigarettes and bottles of alcohol, although getting the bottles back in one piece and within customs quotas required a good deal of skill. This was accomplished by using 105mm ammunition cardboard casings since they made excellent cases for the fine old Chivas Regal. Occasionally goods were not received at their destination in Australia. The reasons for this lay either with parcels going astray within the Australian postal service (PMG) or being deemed a ‘breakage’ by the postal authorities (and no doubt disposed of appropriately). For those who preferred a few beers after work, when time allowed, it was easy to consume their daily ration of two cans per person (unless at an official unit function or by unofficially using the two can allowance from non-drinkers). The allowance system was maintained by unit canteens, which were run by sub-committees “volunteered” by unit officers as official committee members. The officers’ and sergeants’ messes were run on more formal lines although they were also subjected to a daily beer ration of two cans per person. Sometimes when a quiet beer was being enjoyed in the mess a rumbling would start that orders to ‘stand to’ were soon to be delivered. This immediately meant beers were quickly downed, rifles were collected from within arm’s reach and all ranks made off for their allocated weapon pit. The life of an Ordnance Field Park soldier in Vietnam was never dull.